This page will discuss a variety of ways one can best utilize CHEATmeals™ for maximum benefits and results. Please read the "usage" information and see which best suits your individual needs. IF you are a first time user of CHEATmeals™, it is best advised that like ANY NEW SUPPLEMENT, you first start off at lower dose the first 2-3 days, simply to see how your body reacts. What is a "little" for some people, may be a lot for others and vice/versa. Start low, test only 1 or 2 capsules and if you feel fine, then go ahead and begin using the recommended dosages found below, so you can see and feel the REAL effects. This is a practice you should use with any new supplement you begin taking. Below are some important "tips" on how to best utilize CHEATmeals™ for maximum results and benefits -- including the best dosage, timing and additional reported guidelines and suggestions. Life would be nice if just ONE simple pill, ONCE a day is all that it took to see maximum and SAFE results for any supplement, herb, vitamin or drug we take - but that's NOT how life or your BODY works! Most "ingredients" (herbs or drugs) are dose dependant. That means, that generally speaking - the more you take, the better your results. BUT, the problem becomes that if you take too much, more and more side-effects happen -- so there is NO NEED to take more than your body requires. For example, we have clients who see results very slowly because they only take 1-2 capsules maybe once a day at best. Well, at that small a dose, you are barely blocking any calories - maybe 100-200 calories at best. It would take WEEKS to lose even a pound of fat at that rate! This is the same as if you went to work only once a week or an hour or two a day and then wondered why after 50 years of working, you never got rich or were never able to save any money - does this make sense? The More You Need To BLOCK! Basically - the MORE fat, carbohydrates and sugar your meal will contain, the MORE capsules you will need to take. For example, if you are planning on eating 3-4 slices of pizza, you better take 4-6 capsules, 20-30 minutes before your meal with 16 oz of water! With each slice of pizza usually being AT LEAST 300+ calories ... that's a LOT of calories to block and hence, you're going to need a HIGHER DOSAGE - does this make sense? The above is just an example of the "ideal" or "best case scenario". But the basics is simple - the more food you want to block, the more CHEATmeals you'll need to take. If you meal is going to contain only protein and vegetables (hence, not much carbs or fat), then don't bother taking CHEATmeals™ with that specific meal. There is no need. There is NOTHING for it to block and hence, a waste of money. Save it for a "cheat" meal - such as those when you eat out at to a restaurant or party. 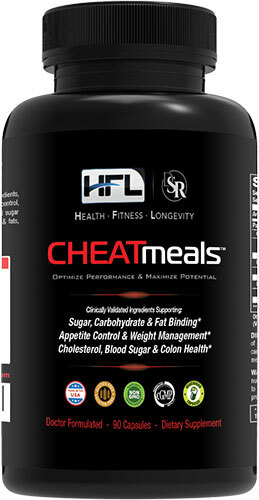 Lastly, because CHEATmeals™ is a FAT blocker, any fat-soluble vitamins (A, D, E & K) or essential fatty acids, should be taken 3 hours before or after ingestion of CHEATmeals™. The best time to take CHEATmeals™ is about 30 minutes before a meal, with 12-16 oz (2 cups) of water. This is because the dual blockers need water to expand in your stomach to be able to capture the fat and sugar calories so you don't absorb them. Also, because CHEATmeals™ contains specific enzymes to digest fats and carbohydrates, taking it BEFORE you start your meal will also help reduce bloat, gas, acid reflux and other digestive problems. If you forget to take it 20-30 minutes before your carb/fat meal as described above, then the SECOND best time to take it is right at the BEGINNING of our meal with 12-16 oz (2 cups) of water. We have a "rapid digest" capsule system that works quickly. Yes, it IS better to take it 30 minutes before, but at the very beginning of meal will work as well (just not as good and you'll need higher dosages). And if you still forgot and only remembered AFTER you finished your meal, then you can take it is AFTER your meal. As already explained above, CHEATmeals™ works with water, by expanding and trapping fat/sugar calories. It's much harder to do this AFTER your meal, when the body has already begun digestion. So, if you do end up taking it at the end of your meals, your results will greatly be diminished and you'll need to double the dosage (hence, it can get costly). Additional reported usage guidelines and suggestions. This is assuming you are not on any kind of diet and simply don't eat too well through out the day. Hence, most of your meals are "okay", but not super healthy. This would be done with your HIGHEST calorie meal, once a day. For most, this is dinner or maybe lunch for most people. Usually, this method works best for those people who eat well most of the day and allow themselves one "cheat" meal DAILY that they aren't super strict about. 5-6 capsules only with really "bad" meals. For those that eat well most of the time and don't really have super high sugar or fat meals, then you have nothing to worry about. BUT, once in a while, maybe once on the weekends, a party, all-you-can-eat buffet, etc. ... you have no choice but to just let loose and eat whatever you want (or maybe you only allow yourself one "cheat meal" a WEEK, rather than daily.) Go ahead and take more capsules to really protect yourself from this super high calorie meal. Remember, with all the above it is best to take CHEATmeals™ about 30 minutes before a meal and with 2 cups of water. As you can see, there are a variety of ways to take this supplement. You can use it daily, without any problems and many people keep a bottle at work or carry a bottle in their purse, briefcase or backpack (you never know when you'll be forced to eat out). Depending on your current diet and goals, the above examples should allow you the best of BOTH worlds - to "occasionally" have your cake and eat it too!